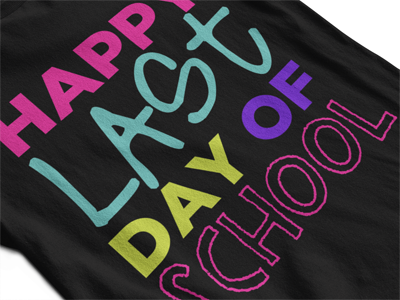 Let’s countdown to the last day of school! 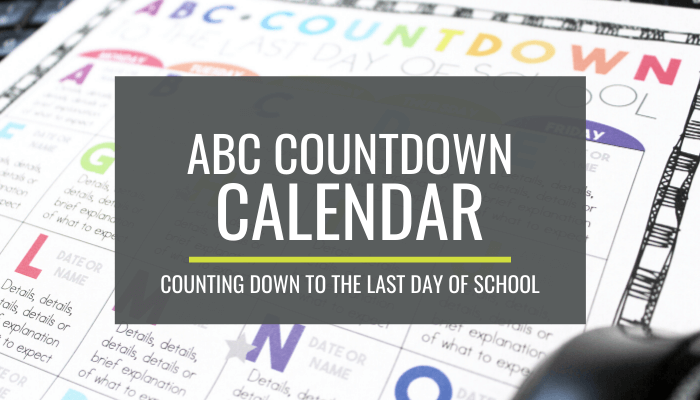 Use this free, editable ABC countdown calendar to plan fun events and inform parents of what you’ve planned for the last 26 days of the school year. 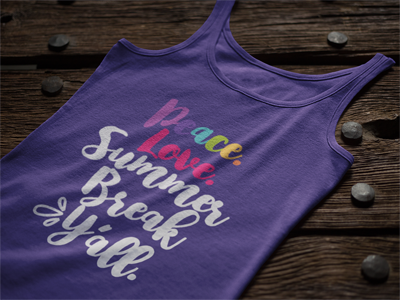 The amount of craziness and sheer busyness that accompanies that last few weeks of school is comparable to getting ready for back to school. Comparable, but not equal, if you teach kindergarten. There is lots to do: final assessments, report cards, Mother’s Day as well as normal teaching awesomeness. 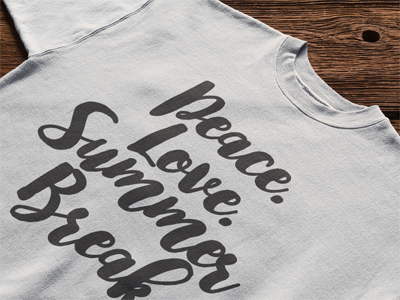 It can leave us feeling super ready for summer and a little worn out. This ABC end of year countdown was personally a way for me to inject a little something to look forward to each day. Mind you, I’m not talking about adding to my plate here in ways that make the end of the year crazier. I’m simply talking about changing up one small thing as a way to keep each day fresh, keep me focused and to inject a small dose of fun. You can go as big or as low key as you want – it just depends on your creativity with what you come up with for the letter of the alphabet. 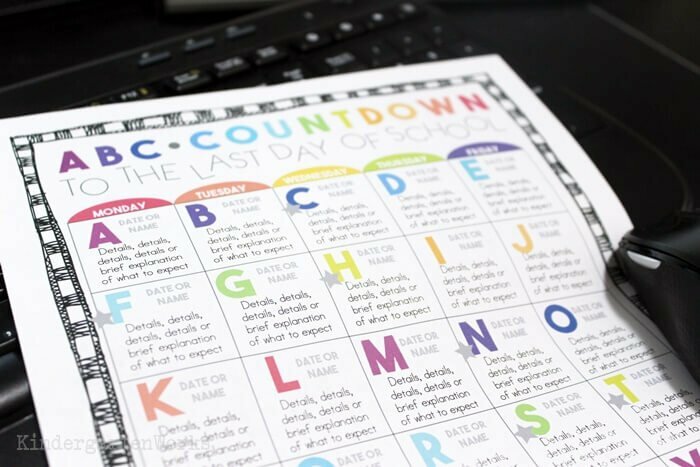 If you’re ready to jump in, be sure to check out these 14 alphabet countdown calendars for inspiration or use my list below. 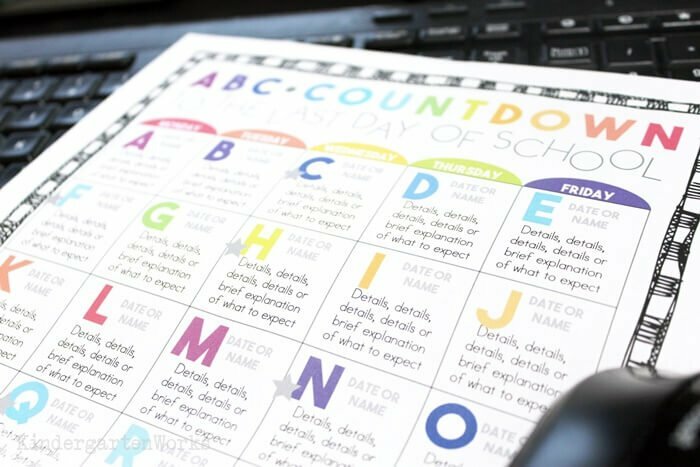 To help you keep this easy to pull off, use this editable calendar to plan your 26 things to do and/or inform parents and students. It’s free! Not sure what to do for each day? I’ll give you a few ideas for each letter that I’ve dug up across the teaching world so you can copy and paste them right into your spiffy new calendar. First, let me explain how to make a countdown calendar. Here are the steps you’ll want to follow to customize and complete your free calendar. Open the file with either Microsoft Powerpoint or Google Slides. Check out the sample on page 4. On page 2 (or 3), type in the starting date in the correct box on your calendar. 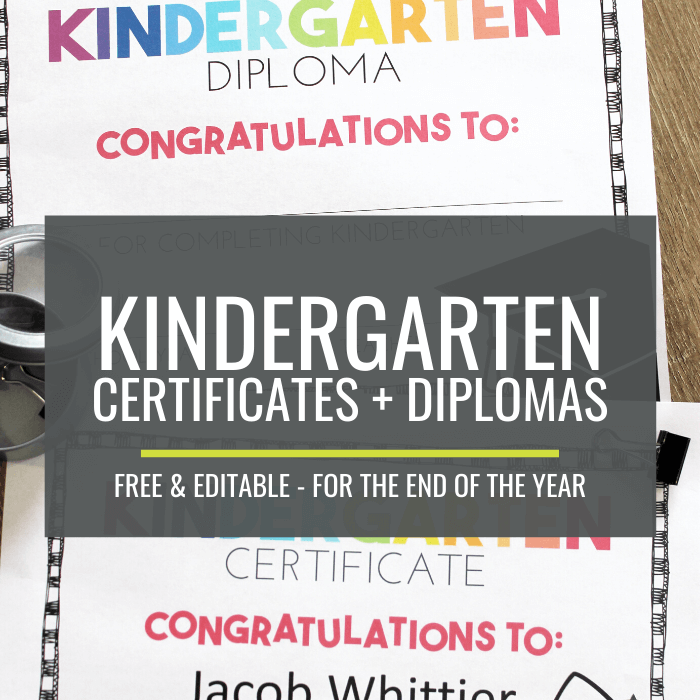 Move or copy and paste the correct ABC digital sticker to that starting date box. If you already know what you want to do for that day, type in the name or write a brief description in the box. Keep filling in the dates, assigning letters and describing your fun events. Optional: Use the stars to indicate that students should bring something to participate. You can use the star box key in an empty calendar space to tell parents that’s what the star means. Not sure what to do for x day? What if you are getting a late start – do you have to wait until next year? 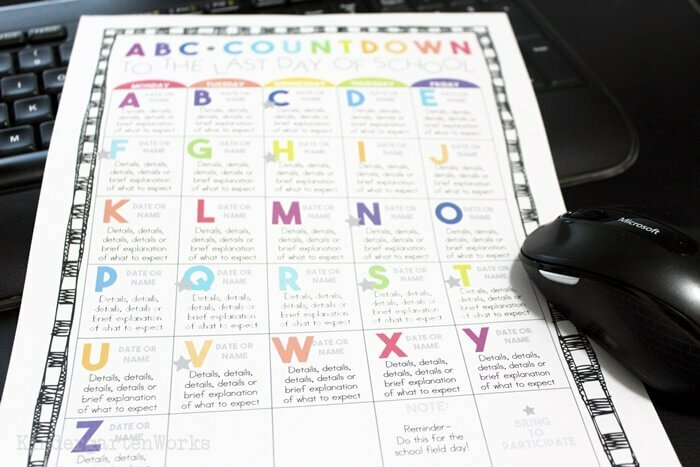 Let’s look at some ideas that other teachers have shared or done for their abc countdown days. I’ll break it down by letters for you. impossible day – superhero capes from cut plastic table cloths – nothing is imposibble for super kinders! Have you already got your teacher shirt for Z day? Here are my current favorites. Hurry – there’s still time to order. You could also do colors for any matching letter! Students wear the matching color of the day. Like R is Red, G is Green, Y is yellow, etc. Can I do an alphabet countdown with less than 26 days of school left? What do I do? And don’t worry if you want to pull this off with less than 26 days of school. You can do it! Simply, chunk together a few letters of the alphabet creatively and you’re on your way. You could make day #1 ABC day. Go out to the playground to do word work (ABC’s) with sidewalk chalk. You’ve effectively tripled up the days into one to better fit the number of school days remaining. Combine C and D to make CD day – and you could literally play a song from someone’s CD or make it a “cards & dice” day – where you build in card or dice games into your lesson plans. Combine H and I to make HI day – learn to say hello in 7 different languages and practice as you walk in the hallways, at lunch and recess. Combine U and V to make UV day – where you do your outdoor activities (like field day) and get in some rays. I love the idea of keeping it simple. It’s my style. 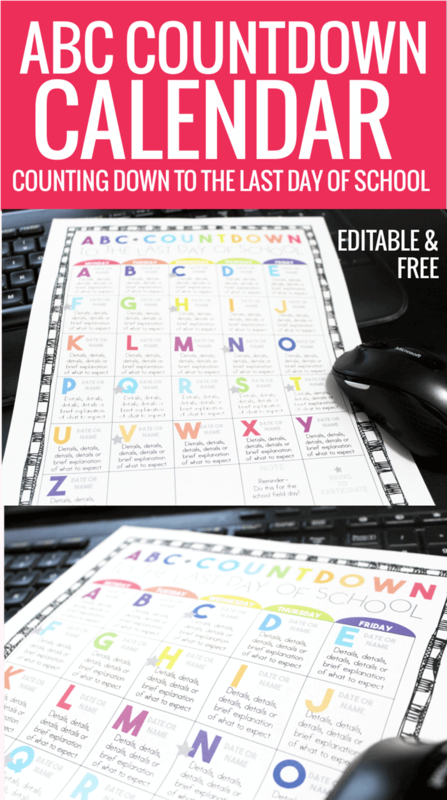 Whatever you decide for each letter day, I hope this editable ABC Countdown calendar can come in handy. Now – it’s your turn! Do you have ideas for us? This post is open which means you can add your comment below and get your idea featured in this post too.